Discounted tickets for all home games can be purchased online through SeatGeek at www.seatgeek.com/skc using the promo code "19SCN". Discounted tickets are only available for the South, East and West stand goal line. We are happy to announce a partnership with Sporting Club, the parent company of Sporting Kansas City. Our inclusion in the Sporting Club Network (SCN) is free and will provide members like you with access to exclusive opportunities and events through this new and innovative program. Sporting Club Network patches - Players of participating clubs will wear a Sporting Club Network patch on their jerseys, signifying their inclusion in one of the largest & most innovative affiliation programs in the US. LASL will provide these patches to all players at the beginning of each season to be ironed on to your jerseys. Mini Clinics – These 90-minute clinics feature on-field instruction from SKC coaches, and give kids (or adults hopefully) the chance to meet and play soccer with their favorite Sporting KC players. Coaching Education Series – All Network coaches will have access to learn from the pros through free coaching clinics that cover a variety of topics aimed to help coaches at every level. These sessions are led by SKC senior team coaches, and are held regularly throughout the year. Chalk Talks – Meet with Sporting KC technical staff pre-game to get the inside scoop on the opponent, keys to the game, and players to watch. Coaches Experience ­– Take a week-long inside look at how Sporting KC prepare for a match, by gaining access to SKC senior team training sessions for the week leading up to a match. Coaches in attendance will hear from different members of the technical staff on a variety of topics tied to the game. SCN Contests – Throughout the year, the SCN hosts a number of contests and programs, where members can win cool prizes, or even exclusive one-of-a-kind experiences tied to SKC. Most of these opportunities take place over our social media accounts on Facebook and Twitter. Special events – Examples can include coaching session with international opponents’ technical staff, private tours of Sporting Park, SKC Watch Parties for away matches, and much more. Discounted tickets – SCN members will have access to discounted tickets for every Sporting KC home game. 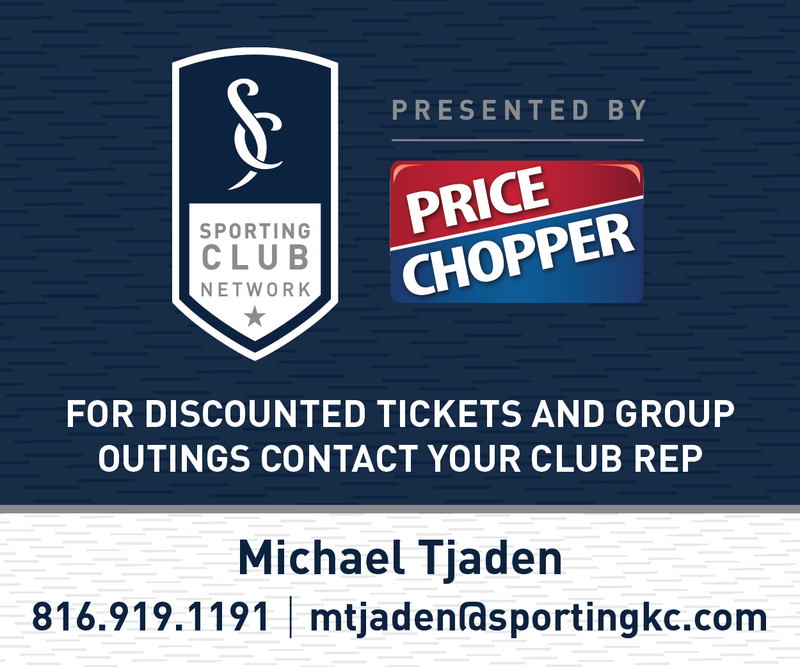 All clubs will also have a dedicated Sporting KC representative to help with ticketing needs. To purchase tickets, contact your club rep, or visit your clubs member page on www.SportingKC.com/scn/members and use the special offer code "SCN" when ready to buy. LASL has a designated SCN representative whom we have worked with in the past – Gabriel Quintero. He can be contacted at or on (913) 387-3838 for all ticketing questions. LASL will be working closely with him for package deals throughout the year. Tickets can also be purchased online through SeatGeek at www.seatgeek.com/skc using the promo code "SCN". Discounted tickets are only available for the South, East and West stand goal line. Please feel free to visit www.sportingkc.com/scn to read more about the program and its benefits, and be sure to follow the Sporting Club Network on Twitter, and Facebook. If you have any questions please contact .